The houses here reflect the memories of those who lived1 here. street. However, they avoided mentioning this at the White Owl. Marble Spring’s business district (store, post office, bank, and millinery) were grandly housed on the respectable side of Carlton Avenue. The Coles lived just far enough away from the White Owl to be respectable, but close enough for business purposes. The Harrises live where they can see what goes on at both the White Owl, the store, and, in the distance, the railroad station. The Lincons live on the edgeskirts of town, next to the cribs. Hezekiah crosses Carlton Avenue to the respectable side every morning at sunrise to begin her work and every evening well past dark when her work is finished. Ivy skirts the Crystal River’s edge going up to the school so she won’t be seen. Rebecca Reaver was not the only one who camped out in this tiny shack beside the White Owl. Jake always said that the White Owl Saloon was on the right side of the track, but that really depended on which direction you were facing at the time. Maddy Bates decided to move from the White Owl to a tiny crib after that disagreement with Ruby over the cut-crystal vase Ruby claimed was from France. However, she could still make it to the White Owl porch on most days. Bridget O’Shanty lives in a tiny crib near the White Owl, between Carlton Avenue and the Crystal River, bordered by the railroad. Cleo Cat lived here to keep one eye on the White Owl and the other on the railroad. The Matesons lived in the middle of the red-light district so that they could note all of the goings on behind the White Owl. Billie Rose used this crib, which was as close to respectable Carlton Avenue as she would ever get. The Marble Springs Railway Station is centrally located and convenient to the business district, town hall and school, Crystal River, and other amenities. The Livery has a large pasture out back where. the Vernons organized ball games for the Hope Town kids. Doc Nancy lived between the church and the White Owl, and it was never quite clear if she was on the respectable side of Carlton Avenue. The Marble Edifice stood proudly in front of the graveyard and well above wind from the White Owl. The Horners lived in the manse behind the church, where the children could play in the graveyard next door. As this was at the edge of Carlton Avenue, Millie could see who left town. Oddly enough, Pastor never did go up on Boot Hill to write his sermons in peace. The graves rest quietly on their perch, rarely looking over the town’s doings. Pastor Horner caught Asa Miller looking at Lottie here. Edna Harris kept a sharp eye on the doings on this avenue. Penny and Ida lived near Lady Lane, enjoying the sunshine off of Settler’s Creek. 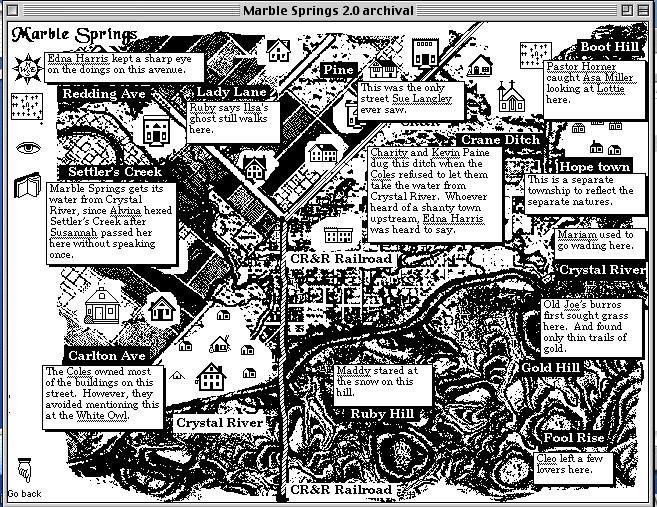 Marble Springs gets its water from Crystal River, since Alvina hexed Settler's Creek after Susannah passed her here without speaking once. Ruby says Ilsa's ghost still walks here. The Millers lived in a lovely mansion down Lady Lane, a bit further away from the White Owl than the Coles did. The Greens could have looked through the Smith’s windows at night—or even the Miller’s, but they kept their curtains closed. The Smiths lived below the jail and just a bit too far from the White Owl for Herbert’s liking. This was the only street Sue Langley ever remembered seeing. " Small cozy home The Grangers lived next to the jail, so Matilda Granger never had to travel far with her hot coffee. The Rubensteins lived on the edge of town, next to the jail. This is a separate township to reflect the separate natures of money and race. Charity and Kevin Paine dug this ditch when the Coles refused to let them take water from the Crystal River. Whoever heard of a shanty town town upstream, Edna Harris was heard to say. Lillian Cooper grew up in a tiny log cabin a little isolated from Hope Town, and close to the river, where she longed to escape. The Turners could barely afford to live in Hope Town. The Vernons’ kerosene lamp throws a soft glow over Hope Town on many winter nights. As their name suggests, the Yamamotos live in Hope Town, at the base of Boot Hill. The Paines lived in the middle of Hope Town. The Rainers lived precariously on the edge of Hope Town. The Morrison horde lived on the outer edges of Hope Town. Mariam used to go wading here. Maddy stared at the snow on this hill. Old Joe's burros first sought grass here. And found only thin trails of gold. Fool's Rise Cleo left a few lovers here. The graves are a better way to find out about the natures of the town. A go back button which has absolutely no meaning whatsoever in an internet context. At last we are free from the mental constraints of consecutive pages and one-dimensional navigation. 2. Item 1423. Precautions. Before you take unfurnished apartments, satisfy yourself that the rent and taxes of the house are paid, for the goods of a lodger are liable to distress for arrearrs of these at any time while on the premises.